As you are probably very aware, healthier gluten-free snacks can be pretty hard to come by. Especially if you're looking for quick grab-and-go varieties. 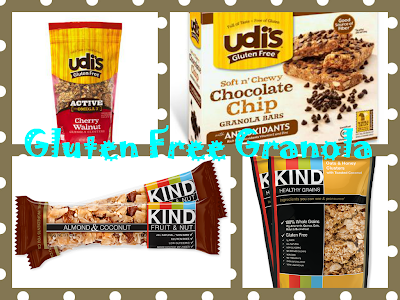 I have to say, I've been kind of living off of Udi's and Kind's granola and snack bars lately. Both brands have a great selection of flavors and their granola bars offer a great alternative to cookies or potato chips for a quick snack. The granola contains all-natural ingredients and a variety of seeds, nuts, and fruits in their granola and bars, so you can rest assured you are having a wholesome snack without all the preservatives and weird additives. I'm sorry if you were hoping for a new recipe this week. I promise I'll get back on track for next week. I was just so excited about being able to have granola now that I had to share! Also, I modified my Gluten-Free Apple Crisp recipe using granola, so I will be sharing that with you next week. 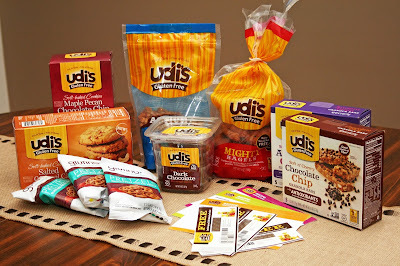 Also if you haven't already, don't forget to enter my #MyGFF contest going on now for your chance to win some delicious Udi's products!!! I have not tried the Udi's granola, but I have seen it at my local supermarket. I love granola and granola bars, and I'm glad that there is a gluten-free alternative for my Celiac husband. They come in handy when traveling! Udi's granola is very good, and I love that it comes in several flavors. Granola and granola bars definitely make a great on-the-go snack!